Moving to an isolated island to live with her new stepfather was not what Isobel expected for her senior year of high school. Nor did she ever imagine that her mother would remarry, especially to someone she met on the Internet only three months ago! Instead of being in Seattle with her friends, Isobel finds herself living in a creepy old mansion and going to a school where she knows no one. Well, next to no one. There’s always Isobel’s crush-worthy stepbrother, Nathanial. While Isobel is frustrated with her life, her problems are nothing compared to Nathanial’s. His mother and sister haven’t even been dead a year and his dad has already married Isobel’s mom. But that doesn't mean he should be taking things out on Isobel. As she adjusts to her life on the island, it becomes clear that something is just not right about her new home. Either Isobel is being visited by the ghost of Nathanial’s sister or she’s going crazy. Isobel’s father suffered from schizophrenia, which went on to destroy his marriage. Isobel shares her father’s artistic abilities, but could she share his illness? As Isobel struggles with a new school, queen bees, an inappropriate crush and her new stepdad, she delves deeper into the mysteries of her new home and its former residents. Could it be possible that some of them never left? 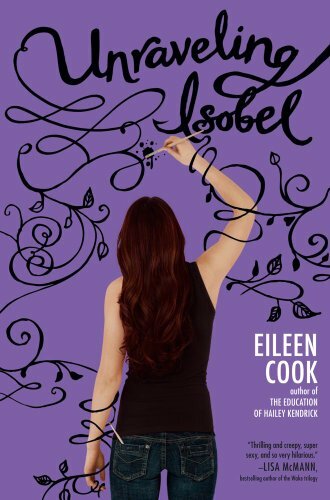 This is my second book by Eileen Cook, the first being The Education of Hailey Kendrick (which I didn’t like, but I saw a lot of potential in the writer.) I was drawn to the title and cover of Unraveling Isobel, plus I always like a good ghost story. While my main problem with Hailey Kendrick was that I couldn’t stand the main character, I enjoyed Isobel and her sarcastic tone right from the start. Cook did a good job of making me sympathize with Isobel, who often couldn’t control the things that happened to her, mainly due to the fact that she’s still a minor. Her mother would deserve the bad parent of the year award if Isobel’s step-dad hadn’t taken it first. Perhaps the strongest aspect of this novel was that it got to my emotions; it made me so angry at Isobel’s parents and frustrated over what was happening to her. One of my favourite things about this book was Isobel’s speech to her class about mental illness, specifically schizophrenia. I loved her speech, since everything she said needed to be said to those girls. So many people have misconceptions about mental illness, and I thought this book sent out some great messages about it. As Dr. Mike points out, Isobel’s life wouldn’t end if she were schizophrenic; like her father, she’d deal with it. While I liked Isobel overall, her plan near the climax of the book was ridiculously stupid and similar to something you’d see in a cartoon. That aside, I liked her and I felt for her, especially since the things that were happening to her were so unfair. Nathanial worked well as her love interest, and I especially liked how he didn’t care what people would think about him and Isobel. All of the teen characters, Isobel especially, felt very realistic. Sure, there was a typical mean-girl, but I think that these types of characters appear so often in fiction because they are common in real life. The plot was engaging and easy to get pulled into. While the end was a bit predictable, I still thought it was an enjoyable read. Unfortunately, the ending wasn’t as strong as the majority of the book. While the beginning of the book was well paced, the pacing wasn’t as strong in the final chapters. It felt contrived and things were wrapped up too neatly in the end. There also didn’t seem to be closure with the ghost, in my opinion, and it felt like everything just ended abruptly. Despite my disappointment in the ending, I really did like this book. If there hadn’t been the paranormal aspect of the plot, I probably still would have enjoyed it. It honestly would have been a good book if it were just about Isobel struggling with moving and having a crush on her stepbrother. Adding the paranormal to the mix made this an exciting read that I didn’t want to end. Overall, Unraveling Isobel was a fun and well-written book, which was packed with romance, teen drama, a setting that seemed to have a personality of its own, ghosts and an awesome heroine. I received this eGalley from Simon & Schuster's Galley Grab program.